Young Vietnamese people show their strong aspiration for self-employing and setting up enterprises amid the fourth industrial revolution (4IR), according to a survey from the World Economic Forum. 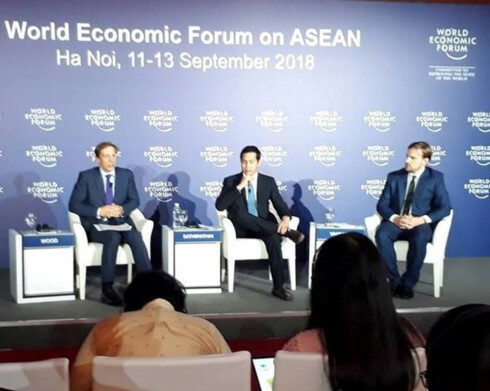 “Among 11,000 Vietnamese respondents, 19% said they are working in official section today, while 25% said they want to start their own businesses in the future,” said Justin Wood, head of Regional Strategies, Asia-Pacific, member of the Executive Committee, World Economic Forum, citing the survey at a media briefing on September 11 on the framework of the ongoing WEF on ASEAN 2018 in Hanoi. The survey, which was run in partnership with Sea, one of South-East Asia’s leading internet companies, gathered results from 64,000 ASEAN citizens through users of Garena and Shopee, Sea’s online games and e-commerce platforms, respectively. The majority of respondents were from six countries: Indonesia, Malaysia, Thailand, Vietnam, Singapore and the Philippines. The survey shows a significant portion of youths (one in four) aspire to work for themselves and start their own business in the region. According to the survey, the youth of ASEAN are highly optimistic about the impact of technology on their job prospects and incomes. Some 52% of the under-35 generation across South-East Asia said they believe that technology will increase the number of jobs available, while 67% said they believe that technology will increase their ability to earn higher incomes. The degree of optimism about the impact of technology on the future of work varied strongly by country. The youth of Singapore and Thailand were much more pessimistic in their responses, while the youth of Indonesia and the Philippines were much more optimistic. In Singapore, only 31% said they believe that technology would increase the number of jobs, compared to 60% in the Philippines. The results also vary by level of education. Among those who stated they have no schooling, some 56% said they believe that technology would increase jobs. Among those with a university degree or higher, only 47% felt the same way. “Fourth Industrial Revolution technologies like artificial intelligence, advanced robotics and self-driving vehicles will bring significant disruption to the job market,” said Justin Wood. “No one knows yet what impact these technologies will have on jobs and salaries,” he said. “Globally there is concern that technological change may bring rising inequality and joblessness. But in ASEAN, the sentiment seems to be much more positive,” he added. However, the findings also suggest that small and medium-sized enterprises (SMEs) may struggle for talent in the future, with a smaller share of the region’s youth willing to work for SMEs. “It will be important to continue to enhance SME adoption of digital technologies to ensure young entrepreneurs and small businesses have the resources they need to succeed,” he added. The survey also reveals that, across ASEAN, the youth spend an average of six hours and four minutes online every day, with 61% of that time spent on leisure, and 39% spent on work activities. Among the countries surveyed, the youth of Thailand spend the most time online – an average of seven hours and six minutes. The youth of Vietnam spend the least time online – an average of five hours and 10 minutes.